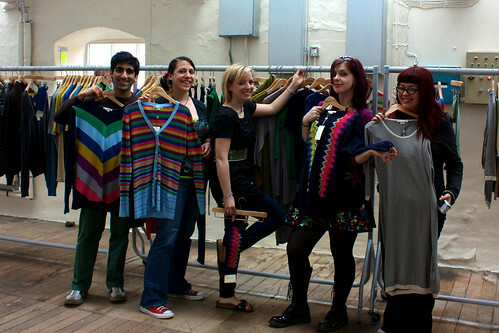 Stitch London was a radioactive woolly Godzilla of a craft group – stitching, knitting and crafting all over London from 2005-2013. It was rather lovely. The group now exists in spirit and social media only. It was the beginning of many many friendships, much money raised for great causes, a whole load of weirdness and loads of great memories. 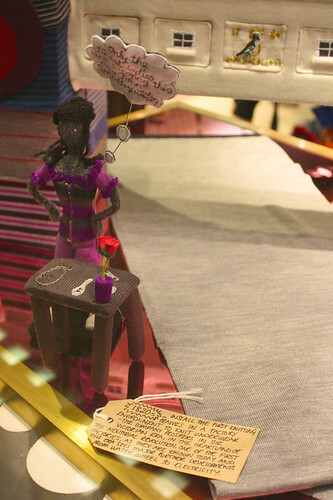 Lauren ‘Deadly Knitshade’ O’Farrell founded and ran Stitch London (with some help from amazing volunteers both Stitchette organisers and Stitch Sage teachers) as a voluntary thing over the course of 8 wondrous woolly years. What began with three people with a grand idea became the biggest knitting group in the UK with over 12 500 members in 52 countries worldwide. 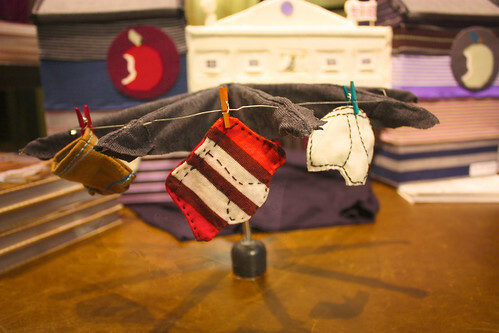 To see the story of how Stitch London came to be hop over to Whodunnknit. Thanks for taking part if you did. 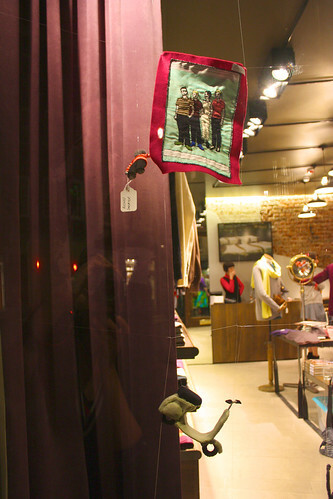 If you missed out, we encourage you to take your craft and go share it with like-minded people. Stitchers are everywhere. 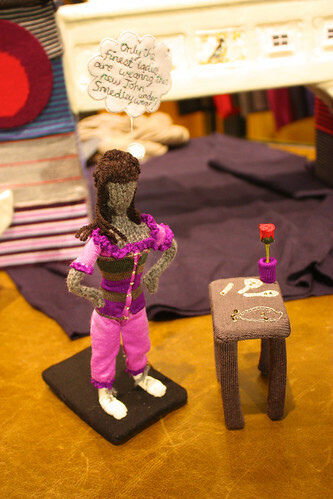 Share the handmade love and help the world submit to the knit! Cooey? Cooooooey? COOEEEEEEEY?!?!? Where on earth did she go? One minute she’s safely tucked into the front of every book in kit form and the next she’s been knitted and has flown out the window. 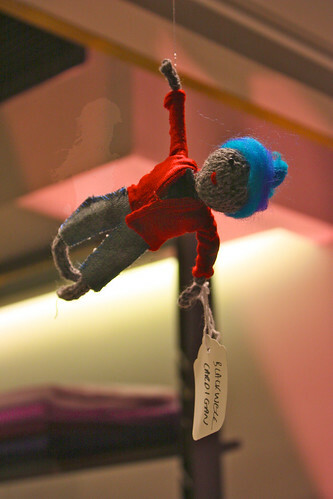 If you have any idea where she is please let Knit the Pigeon know and in return there are yarny rewards! So far we have had three lucky winners and there are seven more weeks to go!!! Every single week for 10 weeks Cooey will flap off into London and land in a famous place. 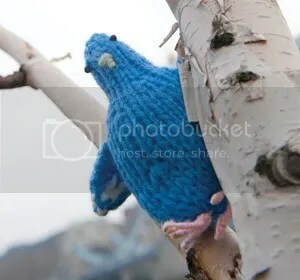 Knit the Pigeon will put up three picture clues for you to guess where she ends up. A new image will be revealed on three different days with each a bit easier than one before. What can you win? 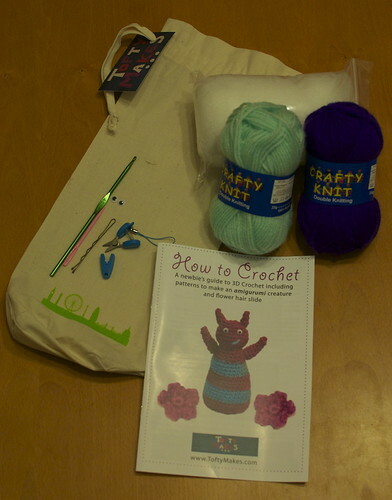 Knit the Pigeon have bagged a whole load of prizes from Coats Craft UK and All the Fun of the Fair. There’ll be a new hamper of prizes every single week. Coo! How do I enter? Flutter over to www.knitthepigeon.com and fill out the form to enter. Terms and conditions on the website. You can enter where ever you live! Join in! Please find Cooey before she gets lost and ends up in a pigeon pie! 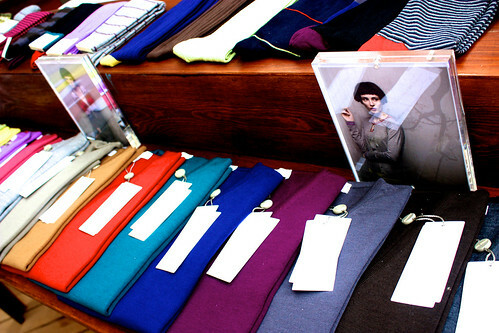 Stitch London the book is here! STOMP! RUSTLE! STOMP! 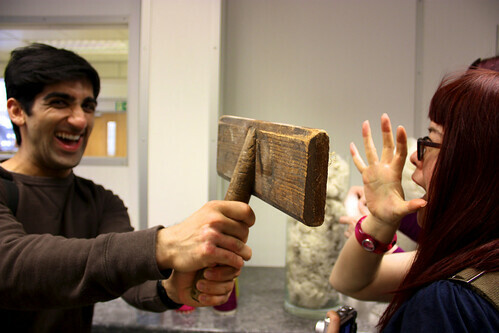 RUSTLE! What on earth is that noise? AAAIIIIIIIEEEEEE!!! 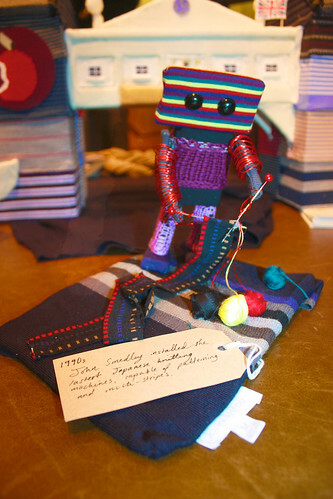 The woolly Godzilla that is Stitch London has been transformed… into a book! And best of all each book contains a kit to knit the world’s most beautiful ladylike pigeon inside. Woo hoo! 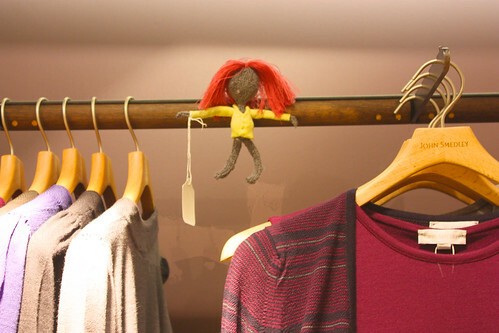 Finally London has its very own knitting book! 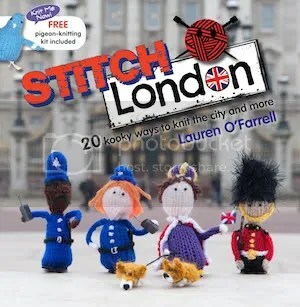 Stitch London, written by Chief Woolly Godzilla Wranger Lauren O’Farrell and published by the good folks at David & Charles, is a collection of 20+ of Lauren’s kookiest London-themed patterns in one shiny book. It’s her first ever pattern book and it tangles together her two great loves kooky knitting and the lovely pigeon-filled city of London. 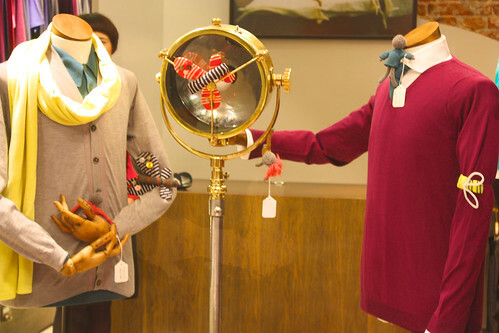 Stitch London? Why would I want to knit London? 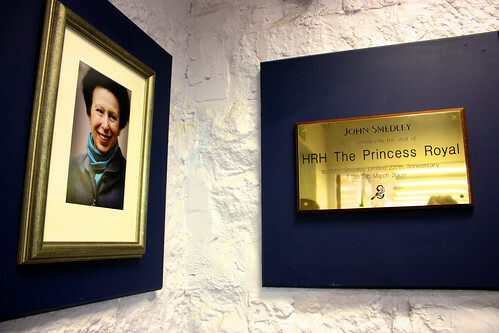 You can whip up your own HRH to add a bit of majesty to your mantelpiece. 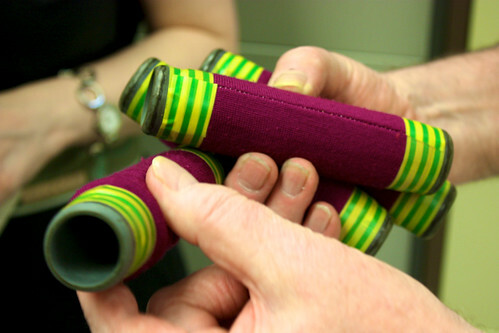 You could woolly up your unexciting umbrella with handful of Umbrella Fellas. 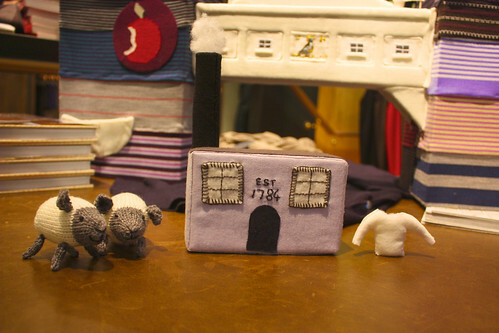 You can build a knitty city with some little London landmarks, and stop your tea getting tepid with a cockney-rhyming slang Mug Hugger. 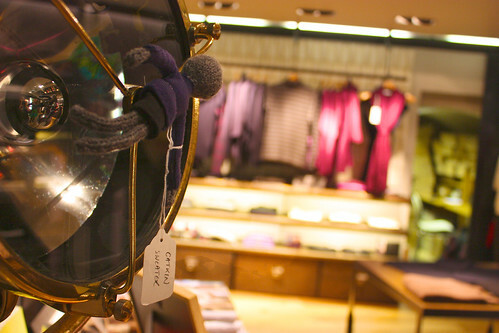 Whether you’re just visiting or striving to survive as a city knitter, Stitch London is the place for you. 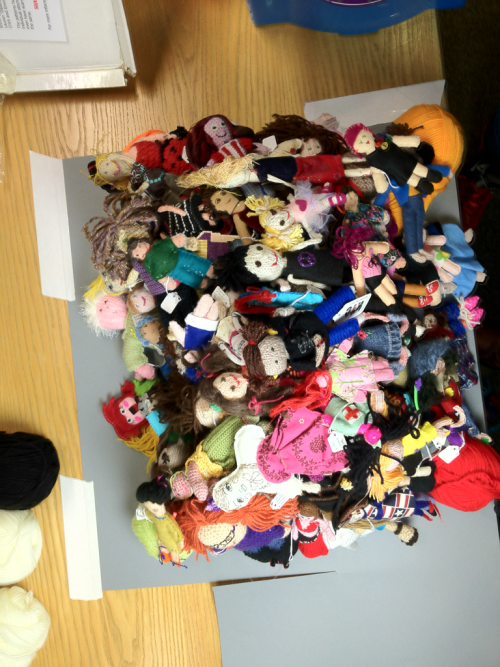 Not a knitter or a bit scared of new knitting challenges? Fear not! We’ll even show you how to get clicking with your sticks and string. We’re nice like that. 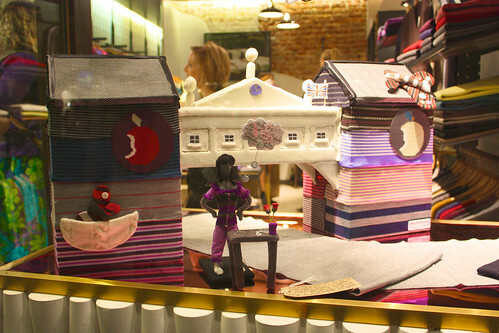 “Cooo coooo…” Oh yes, and it’s not just full of little knits. 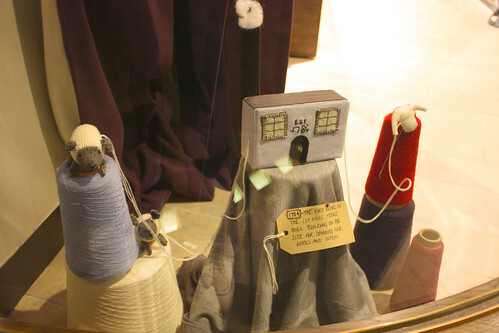 The book also contains everything you need to knit the pattern for the quite frankly gorgeous Cooey the Pigeon. Wheeeeeeeee! And lastly a MWA HA HA HAAA in the face of Cancer. At the same time as the book is published Lauren is celebrating 5 years in remission from cancer. With this in mind all sales of this book support Leukaemia and Lymphoma Research to help other people beat the pants off cancer too. You get two bonus patterns if you register at www.knitthepigeon.com. You can also follow @cooeythepigeon on Twitter and like her on Facebook for updates and exclusive Stitch London book stuff. Coo-coo-cool. 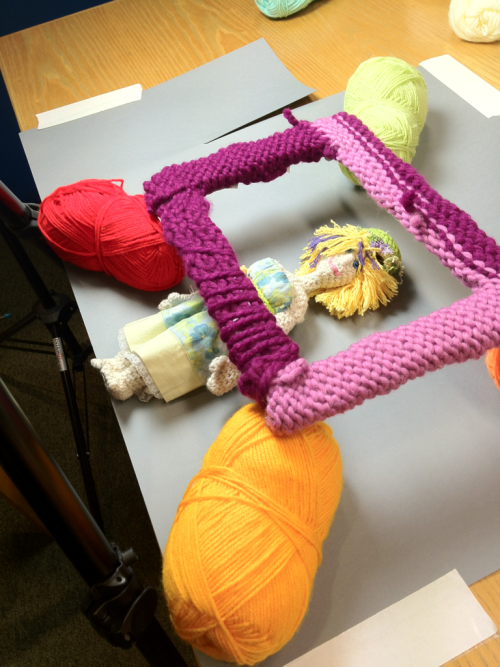 For those of you who might fear that pigeon knitting is a little too challenging for their needles we’ve made a little movie to show you how easy it is. 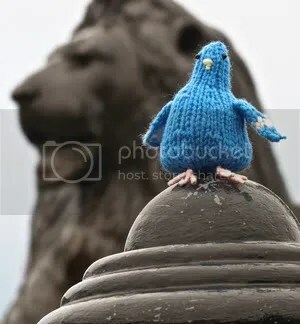 Knit the Pigeon: the Movie contains scenes of daring rooftop knitting, the innards of the Fleece Station where this little pigeon was first hatched and a rather catchy tune. 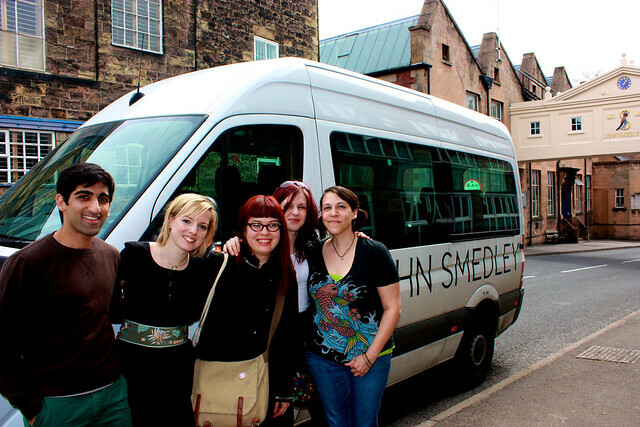 John Smedley Yarnstorm: The Big Event! 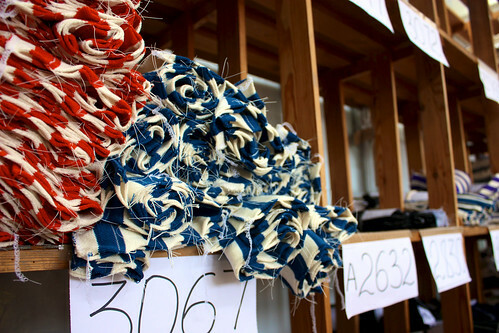 So us folks at Stitch London along with Knit the City‘s sneaky stitchers joined forces to bring the yarnstorm to one of Britain’s oldest knitwear companies, John Smedley. 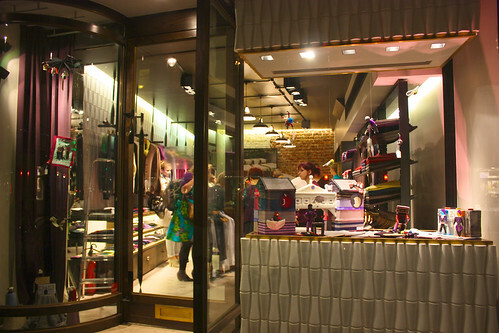 The big event took place on October 11 at the John Smedley store on Brook Street. There was bubbly, there was wool, there was yarnstorming. Wanna see? 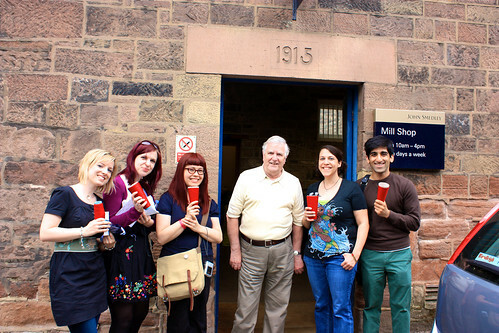 Each of our sneaky stitchers made a little piece of John Smedley history. 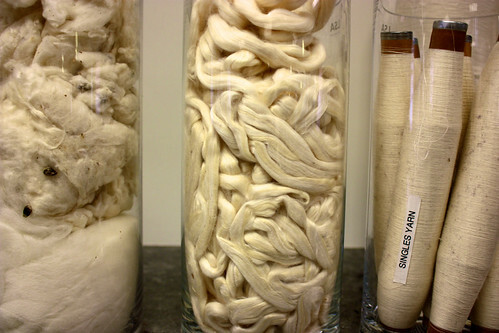 Shorn-a the Dead conjured up the founding of the historic mill where the process of sheep to yarn to woolly jumper was first perfected. 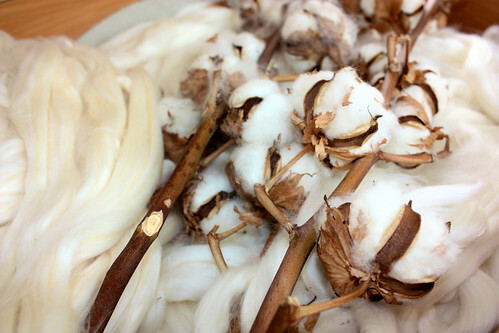 1784 saw the first record of the Lea Mills, historic mill building on the factory site for ‘spinning fine wools and cotton’. The Fastener produced a finely dressed Victorian lady who was happy to tell the world that only the finest folks wore John Smedley underwear. 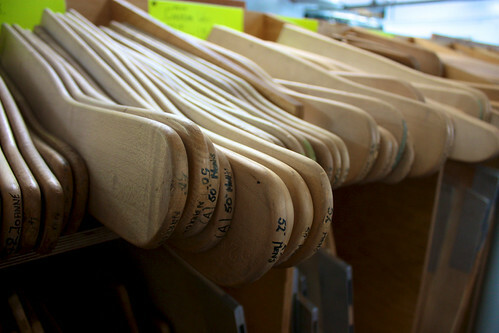 In the 1820s John Smedley installed the first knitting frames in a factory environment to knit underwear. The company prospered in the Victorian era, in the heartland of the industrial revolution. It was one of the first factories,as they are known today and this era sees major further developments from Water wheel to electricity. 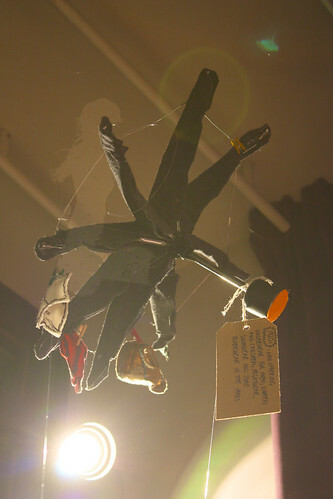 Yusuf Osman whipped up a waving washing line complete with flapping pairs of Smedley underwear blowing the wind. 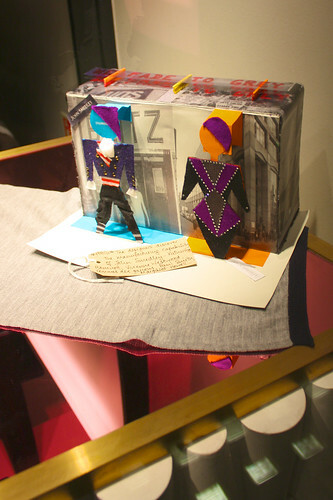 Marion Crick found her fibre inspiration in the 60s with a little vroom vroom on a handmade moped and an embroidered scene of mods modelling their Smedley threads. Keen to keep up with the latest looks the guys decided to wear their newest Smedley gear to the new Mod club. Steve got the message slightly wrong. 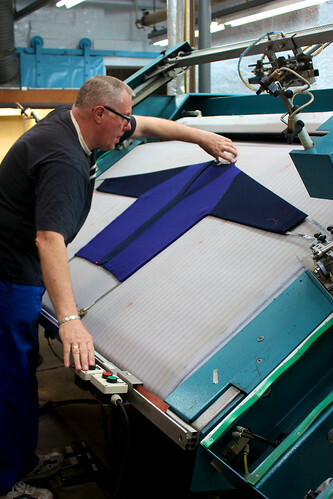 In the 1960s John Smedley went from underwear to outerwear. 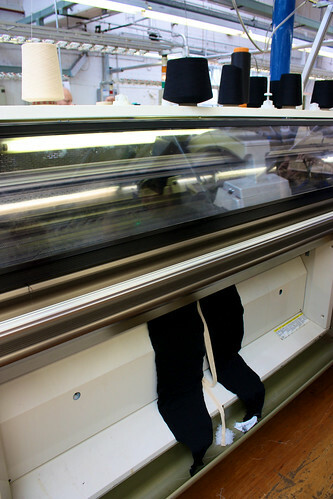 They made the breakthrough from a heavy reliance on the production in underwear to more outerwear styles, particularly in the European and American markets, where the demand for smart ‘Sports wear’ look is strong. 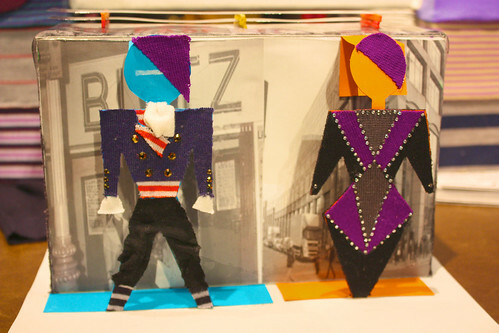 Emma-Lee Yarwood gots her 80s on via the medium of fabric fabulousness with her New Romantic scene. 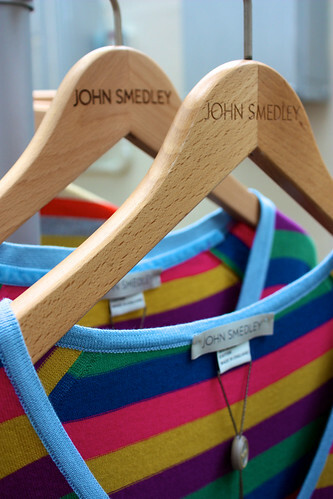 In the 1980s the designers discovered the manufacturing capability of John Smedley. They collaborated with some of the world’s most famous designers, the likes of Katherine Hamnett, Vivienne Westwood, Commes des garcons, Paul Smith and Margaret Howell. Deadly Knitshade turned her yarnstorm Japanese to show Smedley taking on the latest knitting machine technology from the Far East. 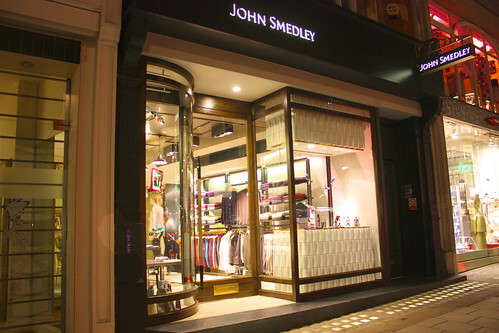 In the 1990s John Smedley opened the flagship store at Brook street, started the web store, and installed the latest Japanese machines, capable of patterning garments and multi-stripes. 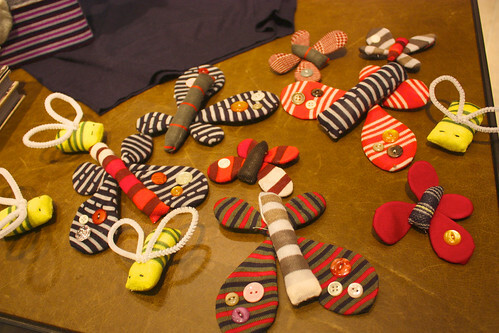 The lovely Lady Loop put her needles to work on making a handmade hive and handsome Smedley fabric bugs and butterflies. 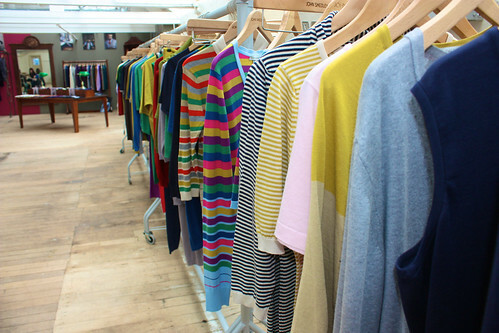 And not forgetting the fashion parade of 11 of John Smedley’s most iconic items, including the Long Johns which the company invented! 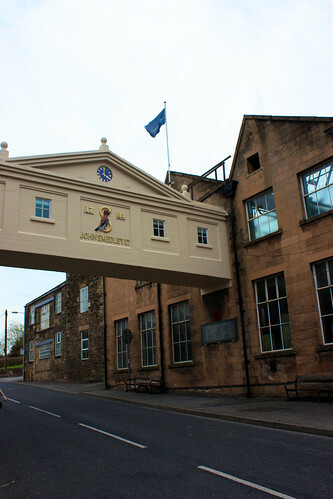 And last but by no means least the John Smedley factory bridge. 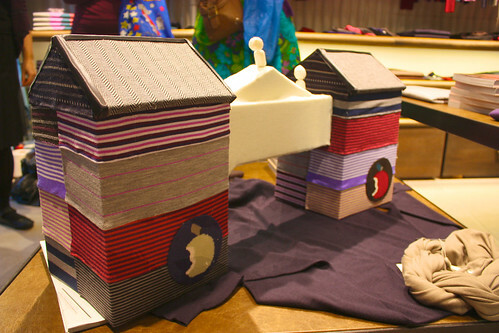 This marvellous monster was created by The Fastener (with a little bit of help from Deadly Knitshade and Shorn-a the Dead) and is a tribute to the bridge on site at the real life Smedley factory. 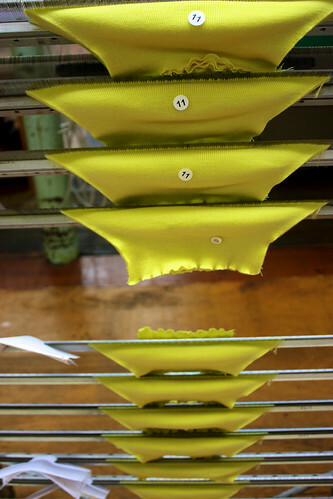 An astonishing work of fabric and inspiration. After admiring it all it was time to yarnstorm. And yarnstorm they did. 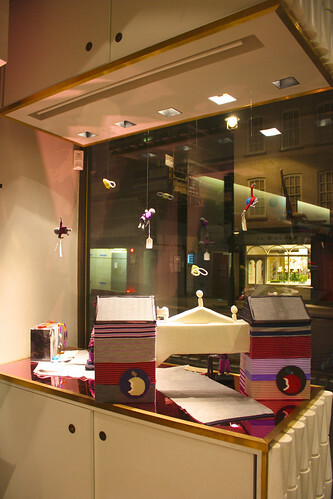 The installation will be in the John Smedley window at their Brook Street store for the next two weeks. Go and see it! 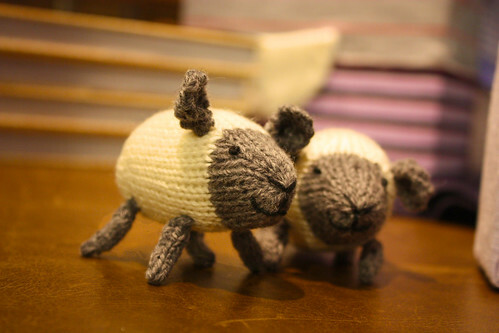 Have a happy Wool Week, everyone! 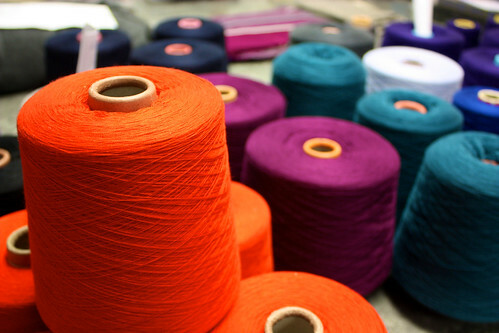 Stitch London and Knit the City‘s sneaky stitchers are teaming up to bring the yarnstorm to one of Britain’s oldest knitwear companies, John Smedley. 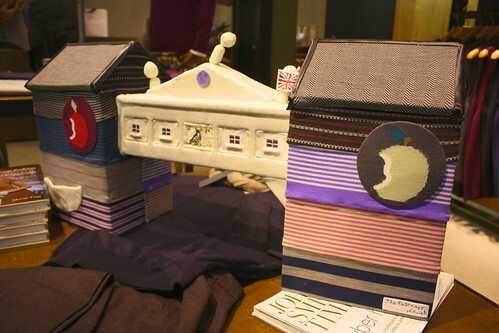 The big event takes place on October 11 but here’s a little sneak peek to keep you in the woolly loop. Sneak peek three is from Marion Crick who gets her 60s on with a little vroom vroom. 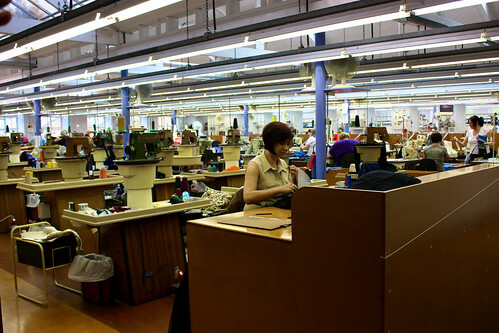 Back in the summer Stitch London were contacted by a giant in knitting history, the good folks at John Smedley. 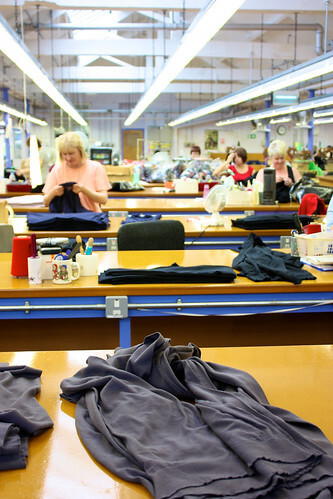 John Smedley are one of Britain’s oldest knitwear companies, established 225 years ago in 1784. That is some serious time knitting. 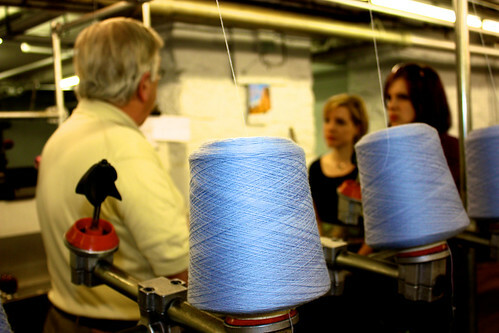 John Smedley invited the Stitch London Stitchettes up to Matlock in lovely Derbyshire to see where the knitwear action happens and learn a little about the Smedley Family. 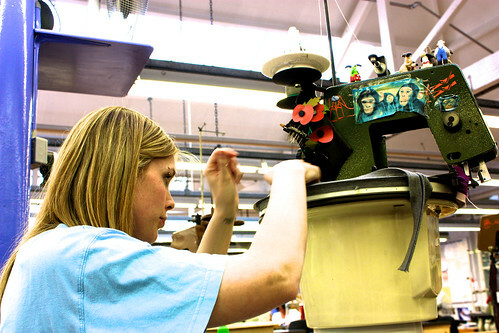 Fancy coming with us on the factory tour? First stop was a room full of the finished product. Much squealing and ooing and ahhing ensued. 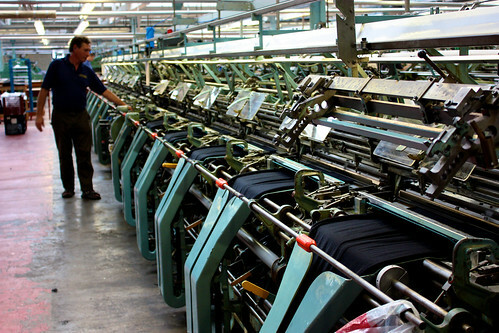 Then onto the factory and a some lessons in knitwear history. We were shown around by our tour guide John (not the Smedley John but another one) who had become a tour guide after working in the factory for over 30 years. 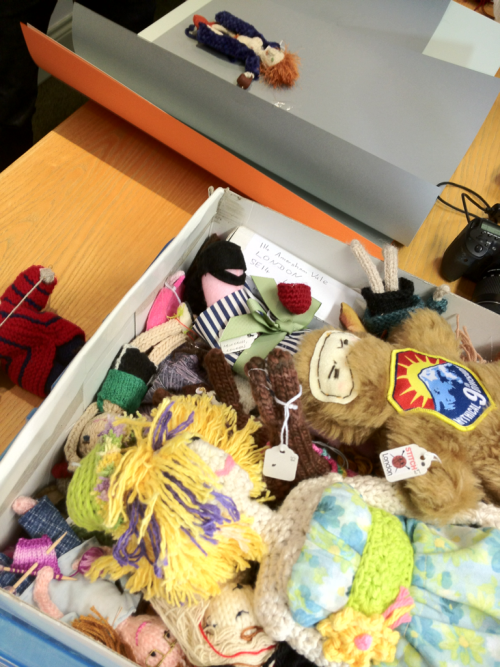 He knew everything there was to know (and he let us snaffle a few lovely yarny scraps too). Then off to the room where all the finishing is done. 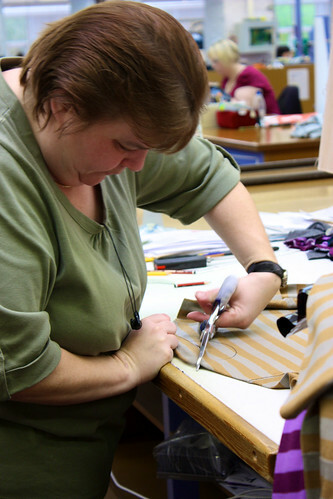 The people working there were doing wonders of stitching. Amazing stuff. The tour ends. 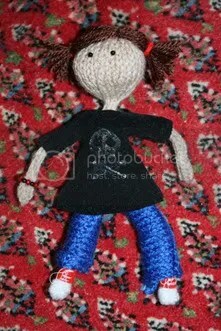 Red yarn for all! Yay! 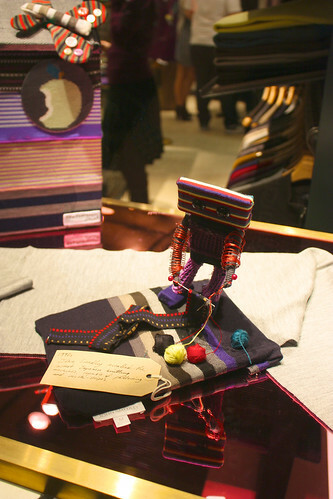 This was all in preparation for a very special project where graffiti knitting will meet traditional knitwear, as Stitch London and their sneaky stitching friends at Knit the City yarnstorm John Smedley’s Brook Street store in central London. 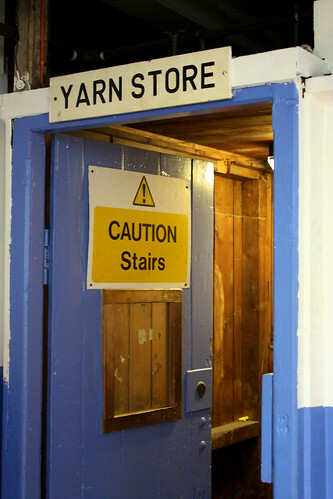 You’re all invited to come along and see the yarnstorm. You can even join us at the launch on October 11. 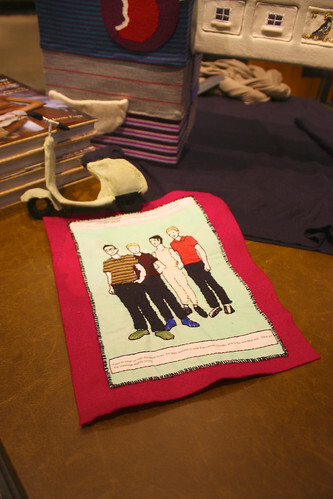 The entire piece will be made of John Smedley’s yarn and scraps left over from their clothes making. Cancer is utterly rubbish. 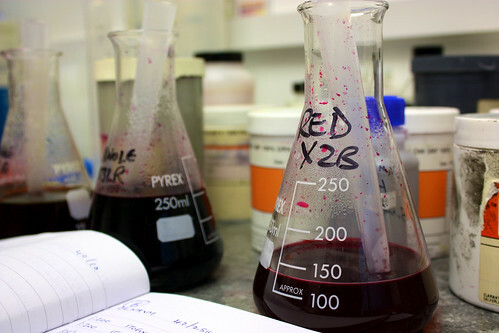 It is a fiendish foe that deserves jabbing with our DPNs until it gives up and goes away. Fancy helping us vanquish cancer by supporting those fine folks fighting it and treating yourself to one of three fabulous knitting patterns? 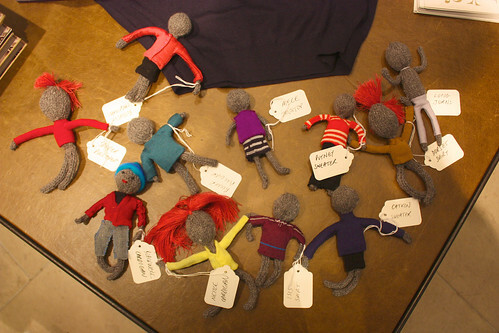 Team Raging Wool are a six-person team of knitters (and those sympathetic to the woolly cause) whose mission is to kick the tar out of Cancer by trekking 20 miles across London in one night for Maggie’s Centre Night Hike on 17 September. To help team Raging Wool reach their target of £1200 they’re offering three patterns for which they invite you to donate and download. Another reason to donate: Stitch London are also going to teach a ‘Stitch a Squid’ workshop at Maggie’s Centre later in the month. Knitting is the perfect way to fill hospital time and time spent in waiting rooms, as well as being hugely therapeutic (as you all know). Help us to help them. 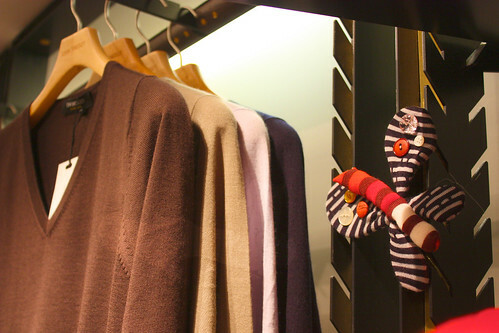 Cosy your technology with a bit of chic cable craft from The Fibre Flinger. Featuring ‘Gertrude Garter & Susan Stocking stitch cable’. 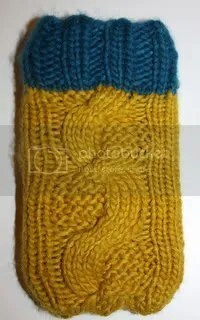 Simple but sweet pattern works by changing between two yarns leaving loops throughout. 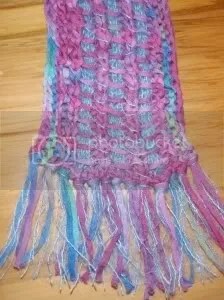 Looks more complicated than it is, which is fabulous for impressing admirers when you’ve had an easy knit. 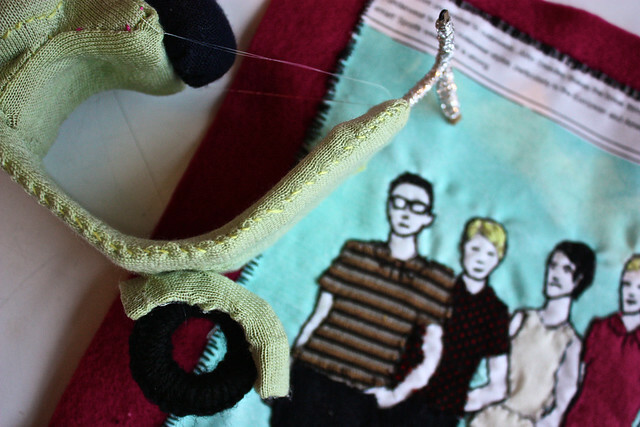 The Knitted Stitched Self pattern in shiny new updated Whodunnknit form, with more ‘how to’ images and more helpful hints on creating a tiny version of you in knitted form.